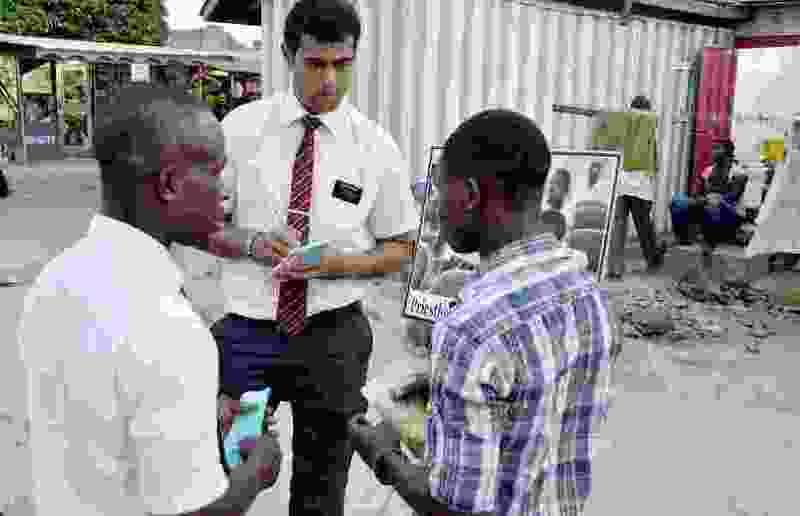 (Mike Stack | Special to The Salt Lake Tribune) Elders Isaac Nyarko, left, and Aumua attempt to make an appointment to teach during a typical LDS missionary street display in Accra, Ghana, in 2014. With its missionary pool receding, the LDS Church announced Thursday that it is realigning the boundaries for 19 missions, creating five new ones and reducing the overall number of missions around the globe. The adjustments come partly in response to an expected decrease in the missionary force from a high of 88,000 a few years ago — after the church lowered the minimum age for service — to 68,000 now. With the changes, the tally of missions for The Church of Jesus Christ of Latter-day Saints will fall from 421 to 407. The newly created missions include Rio de Janeiro South in Brazil and Cabanatuan in the Philippines, along with three African locales —Yamoussoukro in Cote d’Ivoire (Ivory Coast); Ibadan in Nigeria; and Bulawayo in Zimbabwe. In all, 19 missions are being realigned or merged in Logan, Utah; Modesto, Calif.; San Fernando, Calif.; Federal Way, Wash.; Chicago West, Ill.; Jackson, Miss. ; New York South. N.Y.; Cleveland; Sydney North, Australia; Sofia, Bulgaria; London South, U.K.; Athens, Greece; Reynosa and Ciudad Obregon, in Mexico; Porto, Portugal; Moldova, Romania; Samara, Russia; Malaga, Spain; and L’viv, Ukraine. The Utah-based faith also announced 111 new mission presidents and their wives. The latter are listed as “companions.” Most of the couples will begin their three-year assignments in July. That list includes Dave Checketts, former general manager of the Utah Jazz and the original owner of Real Salt Lake, and his wife, Deborah, who will oversee the London Mission. Matthew Holland, Utah Valley University’s president, and his spouse, Paige, will head up the Raleigh, North Carolina, Mission. He said that was particularly true of nations in southeast Europe, noting that the Athens mission, organized a quarter-century ago, had managed to attract just 800 members spread over only a handful of congregations. Those numbers are even more lackluster, given that the Athens mission also encompasses the island nation of Cyprus. Also indicative of Mormonism’s challenges in southeastern Europe, he said, is the snail’s pace growth in Ukraine and Bulgaria. As for the new missions, the researcher was not taken by surprise. “Several of those had operated in the past, but had been closed or relocated,” Martinich said, pointing particularly to Nigeria. Between 2002 and 2011, he said, growth essentially stalled in Nigeria, but has exploded in recent years, primarily among the nation’s Yoruba people. According to the church’s website, membership in Nigeria, at 30,300 in 1997, has mushroomed to nearly 153,000.